Boom, Boom, Boom, Happy New Year & a Giveaway! Happy New Year! Thank you so much for supporting the blog and leaving comments. Our New Year plans doesn't involve anything glamorous( gasp!) yeah I know!!! but that doesn't stop me from creating a simple card by adding a little spark to the invitation for a few friends. We plan to go to church, then have a few friends over to ring the new year! Here's the simple card I created. My biggest challenge was to keep it simple and just use the cuts off the cart. Cut the envelope first I cut at 7 inches, ink the edges. Card was cut at 4.5 inches,ink the edges, add bling cut the year out of bling cardstock ink the edges. Uhu Glue, Wild card cartridge , graphically speaking cartridge , Cricut Expression from Provo Craft, Bling cardstock DCWV, Rhinestone Mambi, Fluid chalk by Colorbok. Happy New Year! to start the new right I’m giving away From Kitchen Cartridge! Cartridge is donated by our sponsor Provo Craft. Happy Hump day! How was your Christmas? Mine was pretty quiet loads of time with family and catching on movies. Watched the movie District 9 , I gotta say it was pretty sad, and predictable...we watched Julie & Julia that was pretty good, Harry Potter the half Prince blood was my fav by far. I was so clooooose to being done with all my gifts and sending cards to everyone this year, then my DH hit me with don't forget Georgeanne Birthday! what, what, it's your sister's Birthday again???? I gotta tell you it's cold here in Florida in the 39's the idea of going out in this cold weather is not appealing at all. Basic Grey Pattern Paper, Cuttlebug Machine from Provo Craft, Spellbinders Nestibilities label # 8, Uhu Glue, Colorbok fluid chalk. Prima got flowers flowers, Martha Stewart Punch , Mambi pearls, Inkadinkado stamp, brilliance ink. PS have you seen the new folders coming out from Provo Craft the Asian Line? I hope you find it in your hart to forgive me for not being active on here, I plan on doing a better job coming this coming New Year! Here’s a recap of our winners, some of them have been notified and prizes have already been sent. Jolly by Golly Christmas is almost here! We are only 72 hours away from Christmas, what happened? Seriously, ladies, I'm frantic looking for something, anything, for my DH! Now I gotta tell you there's no tool invented he has not had in the garage, so tools are out..
Books, he is an avid reader so that one is out...My friend Michele gave us a restaurant GC for the year, so that's out as well.. While I pondered what to give DH, yet what Santa will bring him? Do you by any chance know what a postcard card is???? Well, let me tell you. Ok here’s an easy explanation - it’s a one layer card that is not a folded card. Just like a postcard, you get to stamp or write your sentiment on the reverse side… the twist is, like a card, it does have an envelope. Yep, ladies, you’ve seen this here first, shhh……. 1.Cut cardstock base to measure 4.5, cut Pattern paper 4 1/8, adhere to the base. 2.Cut 1 scallop on the Cricut 3 inches, another at 2 1/2, ink the edges, use the Cuttlebug machine to emboss the scallop, stamp a sentiment. 3.Cut another strip 4 1/2 by 1 1/2, ink the edges and stamp. 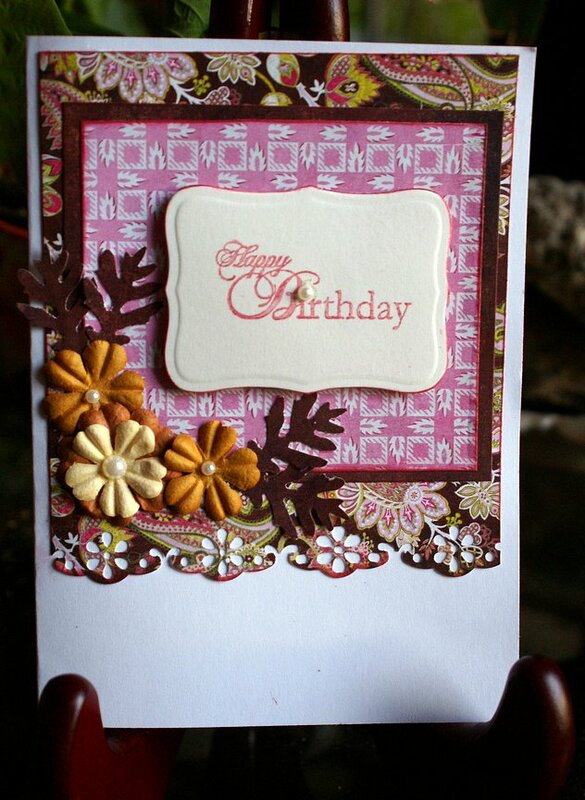 I stamped the envelope with a corner stamp to add more texture. Uhu Glue, Scor-it, Inkadinkado, Technique Tuesday,Mambi, Cricut Expression, Cuttlebug Machine from Provo Craft, Nestabilities, Colorbok fluid chalk. Have a great day, and if you have any ideas on what I should get, please let me know? Can you believe we are 3 days away from Christmas? Where did the year go? I'm amazed that we are only 3 days away from my Favorite time of the year..
Are you all set? any last mte gifts you need to create. 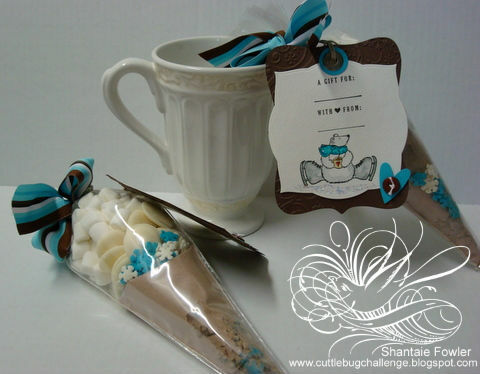 Have you seen all the great ideas on the Cuttlebugchallenge blog? I have several carts on my Christmas wish this year, including a bag for my Cricut. com, I was excited to see on Cricut.com you can create a wish list then send it to your family and friends, what could be more easy than that? Provo Craft has made it easy to be able to select the items you want. Have you seen the bundle that was release on HSN a few weeks ago are on Cricut.com now! 12 Days of Christmas Inspiration-Decorative Plate! Today is day 2 and the 12 days of Christmas is the Dove! at Cuttlebug Challenge Blogspot, I’ve created this Home decor using the Dove as an accent piece to carry the theme. Cricut Expression,Gypsy, Cardstock from Provo Craft, Storybook Cartridge, Hannah Montana Cartridge, Making Memories papers and embellishments, Bling and twig from Micheal’s, Jenni Bowlin Bingo Card,Uhu Glue, Ribbon Mayart. Charger Plate. 1.Cut the embellishments from the Gypsy, I cut the scallop at 8 inches to fit onto the plate, cut the Dove, cut 4 stars in decreasing sizes. 2.Ink the edges of the scallop and adhere to the plate, cut 1 mat 6 3/4inc and another at 7 inches, adhere to the scallop. 3.Wrap ribbon around the bingo card and add the pin hat, adhere to the side of the mat. Mat the trees with various cardstock colours, ink the edges of the stars and add the to the right under the Bingo card. 4. Add embellishment around plate and add the Dove to the left of the trees. 5. Add the silver twigs to the back of the bingo card. Voila you are done, very easy! Have fun, don’t forget to leave me a comment let me know what you think?